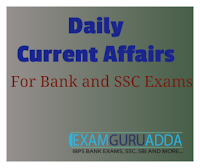 Dear Readers, we are presenting Daily Current Affairs for All Exams- 20th December 2016. 1. Justice J S Khehar has been appointed as the new Chief Justice of India after President Pranab Mukherjee’s approval. 2. Khehar, who led the five-judge constitution bench in the Supreme Court which had struck down the controversial NJAC Act for the appointment of judges, will replace Justice TS Thakur as the top judge. Thakur will be demitting office on January 3, 2017. 3.Justice Khehar, 64, will be the first Chief Justice from the Sikh community. He will be sworn in on January 4 and will hold the tenure for over seven months till August 27, 2017. 1. India and Kyrgyzstan have signed six Memoranda of Understanding (MoU)/ Agreements including in the fields of tourism, agriculture and food industry etc. 2. These agreements were signed after delegation level talks between Prime Minister Narendra Modi and visiting President of Kyrgyzstan Almazbek Sharshenovich Atambayev in New Delhi. Besides, both leaders also issued joint statement. on cooperation in the field of Tourism MoU in the field of cooperation in youth exchange. MoU on cooperation in the field of Youth development MoU on exchange of information on training programmes of diplomats. Agreement on cooperation in the field of Agriculture and Food Industry. MoU on cooperation in the field of Broadcasting and exchange of audiovisual programmes. 1. The 12-foot-tall stone statue of renowned Tamil poet and philosopher-saint Thiruvalluvar was inaugurated at Mela Bhawan in Haridwar, Uttarakhand by Chief minister Harish Rawat. 2. The process introducing Thiruvalluvar statue in Uttarakhand was initiated by former Bharatiya Janata Party (BJP) MP from Uttarakhand Tarun Vijay. Initially the statue was planned for installation on the banks of Ganga River at Har ki Pauri in Haridwar in June 2016 but it was delayed after it faced opposition from priests and saints. 1. Prime Minister Narendra Modi laid foundation stone of the country’s first Indian Institute of Skills (IIS) in Kanpur, Uttar Pradesh to make India the Skill Capital of the World. 2. He also inaugurated the Kaushal Pradarshini (Skill Exhibition) for the youth of Uttar Pradesh to portray major skill development initiatives of the Union Skill Development and Entrepreneurship Ministry. 1. The Madras High Court has banned all unauthorised Sharia courts in mosques across Tamil Nadu, saying centres of worship were only to be used for religious purposes. 2. The court’s pronouncement came in response to a PIL filed by a non-resident Indian mentioning that such sharia courts are operating as a court of law from mosques and dealt largely with matrimonial disputes, even going to the extent of passing divorce orders. 2. It was achieved due to the efforts of the CSC e-Governance Services India Limited and the National Informatics Centre. 1. Karnataka Chief Minister Siddaramaiah inaugurated state’s first air ambulance service at HAL airport in the state capital Bengaluru. The air ambulance service has fleet three newly built helicopters which are specially designed to fulfill the requirements of the patients while transporting them from one place to another. 1.Stephanie del Valle (19) of Puerto Rico has been crowned Miss World 2016. She was crowned by Miss World 2015 Mireia Lalaguna of Spain. 2. First runner-up in this competition was Yaritza Miguelina Reyes Ramirez of Dominican Republic, followed by Natasha Mannuela of Indonesia. Del Valle is a student who speaks English, Spanish and French and plans to join the entertainment industry. 1. Noted economist and former member of erstwhile Planning Commission Saumitra Chaudhuri passed away due to lung cancer. He was 62. He was appointed member of the Planning Commission in June 2009 and was one of the longest serving members of the Planning Commission. 2. He also had served as chairman of the Committee for Formulation of All Industry Rates of Duty Drawback ( 2005-06 to 2009-10) in the Union Ministry of Finance. 1. The International Migrants Day was celebrated on 18 December by the international community to recognize the efforts, contributions, and rights of migrants worldwide. Observance of the day marks anniversary of the UN’s International Convention on the Protection of the Rights of All Migrant Workers and Members of Their Families. 2. It was approved by the UN General Assembly on Dec. 18, 1990. Earlier in September 2016 the UNGA had adopted New York Declaration for Refugees and Migrants. The declaration is set of commitments during UN members first ever summit on large movements of refugees and migrants to enhance the protection of refugees and migrants. 1. Ukraine has nationalised the country’s largest bank PrivatBank in an attempt to avert a financial meltdown. This decision falls in line with International monetary Fund’s (IMF) demands for Ukraine to stabilise its financial sector in order to achieve sustainable growth. 2. It is even said that Government took over PrivatBank after months of rumors that it was heavily burdened by bad debts. PrivatBank controls one-third of east European country’s bank deposits and has branches in Baltic States also. 1. The Employees Provident Fund Organisation (EPFO) has lowered the interest rate on provident fund deposits to 8.65% for the current fiscal, from 8.8% in 2015-16. 2. This decision was taken with consensus after detailed consultations with all stakeholders at the 215th meeting of EPFO’s apex decision making body, the Central Board of Trustees. Roughly around 17 crore subscribers’ accounts will be updated with this interest rate upon acceptance by the Government. 1. Atletico De Kolkata FC won the third edition Indian Super League (ISL) football tournament. It is second time the football club has won this tournament in three years. 2. In the final match held in Kochi, Atletico De Kolkata FC defeated Kerala Blasters 4-3 in a penalty shootout. In the regular stipulated time both teams were one goal each in the stipulated time. Earlier it had inaugural title of this tournament in 2014. 1. India won the 2016 Men’s Hockey Junior World Cup title by defeating Belgium by 2-1 goals. The final match was held at Major Dhyan Chand Stadium in Lucknow, Uttar Pradesh. 2. This is first time host country has won the Junior World Cup. The third place was bagged by Germany after it was defeated by Belgium in semi-final.